I am lucky that for my line of work I rarely have to wear a suit and tie. When I do though I like to wear ties that compliment by blue eyes. I try to find ties with lighter shades of blue to make my eyes look brighter. During the winter season or overcast days, I will wear darker blue ties. Sometimes I will try to match a tie to my dirty strawberry blonde hair. In that case, I will aim for orange, light blues, or light reds with slight contrasts in color with respect to my suit and shirt. When I do find the need for a new tie, I never buy a tie from retail. There are many ties one can buy from brick and mortar stores as well as online shops. 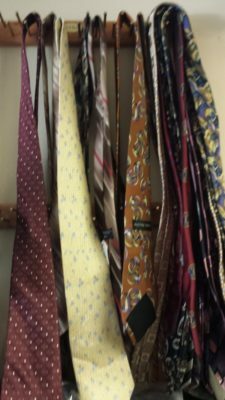 However, when you do buy at a regular store you will be paying a premium for some ties in the several hundreds of dollars per tie range. Even at retail discounters, while heavily discounted down, quality ties or name brand ties will still burn a hole through your wallet. At these discount stores, their own department store brand ties can run between $15 and $20 per tie. Name brand discounted ties like Hugo Boss or Robert Talbott will run between $50 and $100 per tie. If you are an infrequent tie wearer and buy from a big box store like Walmart, Target, or Kmart low-end ties start at about $7 and will run upwards to $15. Higher end ties can go up to about $35 per tie at these stores. At online stores such as Amazon or Jet tend to run from $10 to over $100 per time from generic to name brands similar to that of regular retail stores. Every man should have a reasonable number of ties, 8 on average if you are an American, the costs of buying ties at retail can range from $56 on the low end to over $800 on the very high end. These numbers will change depending on who you ask and how often you have to wear a tie with costs increasing the more ties that are required. Ties at thrift stores can be a fun treasure hunt adventure. Before hand, I like to know what shirts and suits I have and what colors make a good match. If I have a particular shirt or suit I am trying to find a tie match for I will wear the actual clothing to the thrift store so I can match the tie right there on the spot. Just recently I was looking and found a $1.99 darker blue, gray, and black geometric pattern out of print Carlos Devenezia silk tie at a local thrift store. Even though in the spring and summer I prefer lighter color ties, in the late fall and winter I prefer darker ties, and I never pass up a great deal on something I will use. In fact, I plan on using this tie for a themed murder mystery dinner party some friends will be hosting in the near future. The tie if I was to find it online at Esty or Ebay I would be paying somewhere between $10 and $25 not including shipping and handling. I also like looking for vintage ties. In the late 1990s, the trend for ties was going to a more narrow and skinnier tie. Now that trend is reversing and ties are getting wider again. This means all those old wide retro ties are not just for hipsters anymore. 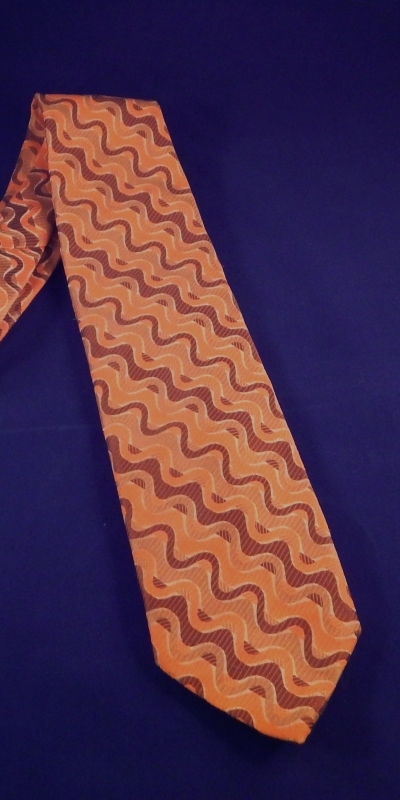 Last month while thrifting out of town I found a vintage 1970s Via Veneto wavy line orange polyester tie. It was in like new condition as if it had been hidden in some closet for the past 40 years. Ties at this thrift store are normally $3, however, on this particular day the store was having a 50% Off Sale and I picked it up for only $1.50. 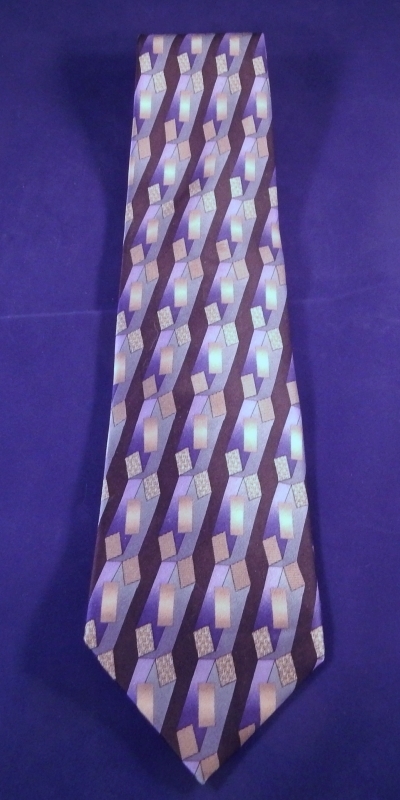 On Etsy and eBay, similar ties have sold for prices around $20. In just my two purchases above for less than $4 I saved, if purchased online, I would have spent between $30 and $45 not including shipping. For those prices, I can stock an entire close to an entire wardrobe of ties and then over time continue to add more as well as fun holiday themed ties. There a lot of classy ties at thrift stores, all you have to do is hunt for them.